He, his wife, Margret, son, Victor Jose, and daughters, Maria Victoria, Barbara and Camila, reside in Orlando, FL during the offseason.• Actively participates in the Tigers Dreams Come True, Autographs for a Cause (donates funds to the Detroit Tigers Foundation), the Tigers Autographed Memorabilia Donation programs and participated in a pregame ceremony prior to the annual ¡Fiesta Tigres! game...Toured Japan with the Major League Baseball All-Star Team following the 2004 season. Appeared in 107 games with the Tigers in 2017...Finished the month of May with a .318 (28x88) batting average with 12 runs scored, six doubles, four home runs and 16 RBI... Sidelined from June 16-28 with an irregular heartbeat...Notched the 2,000th hit of his Major League career on July 7 at Cleveland, becoming one of 12 active players in the majors to have at least 2,000 career hits -- he joined Ichiro Suzuki, Adrian Beltre, Albert Pujols, Carlos Beltrán, Miguel Cabrera, Robinson Canó, José Reyes, Matt Holliday, Nick Markakis, Brandon Phillips and Adrian Gonzalez...Martinez also became the eighth Venezuelan-born player to reach the 2,000 hit mark...Belted a pair of home runs on July 21 at Minnesota...marked his 11th career multi-homer game...Hit the 400th double of his Major League career on August 2 at New York (AL)...became the sixth Venezuelan-born player and the ninth active player to reach 400 career doubles... Sidelined from August 27 through the end of the season with an irregular heartbeat...Played in seven games with Team Venezuela in the World Baseball Classic, hitting .136 (3x22) with two runs scored, one home run and two RBI. Finished the 2016 season with 27 home runs, marking the third time in his career he has hit 25-or-more home runs in a season (last, 32 in 2014)...Ranked tied for eighth in the American League with eight intentional walks...Hit a pinch hit home run in back-to-back games to start the season on April 5 and April 6 at Miami…according to the Elias Sports Bureau, Martinez became the first player since 1900 to hit a pinch hit home run in his club's first two games of the season, while he became the first Tigers player to homer in the first two games of the season since Brandon Inge hit a home run in the first three games of 2009...Recorded the 1,000th RBI of his major league career on April 20 at Kansas City, driving in Ian Kinsler with a sixth inning RBI single -- became the fifth Venezuelan-born player in MLB history to record 1,000 RBI, joining Miguel Cabrera (1,553), Andres Galarraga (1,425), Bobby Abreu (1,363) and Magglio Ordoñez (1,236)...Posted four-hit games on April 29 at Minnesota, May 10 at Washington and July 27 at Boston and now has 18 four-hit games in his career...Named AL Player of the Week for the week ending May 2 after hitting .519 (14x27) with five doubles, three home runs and eight RBI in seven games -- marked his fifth career AL Player of the Week Award and his first since May 15, 2011...Made his first start of the season at first base on May 8 vs. Texas -- also started at first base on May 10 at Washington...Belted three solo home runs on June 16 at Kansas City -- marked Martinez's second career three-homer game (other, July 16, 2004 at Seattle)…according to the Elias Sports Bureau, Martinez, at 37 years, 176 days old, became the second-oldest Tigers player to hit three homers in a game, trailing Ty Cobb, who hit three homers on May 5, 1925 vs. the St. Louis Browns, at 38 years and 138 days old…Martinez also homered from both sides of the plate in the game, becoming the first Tiger to accomplish that feat since Carlos Guillen on September 23, 2009 at Cleveland...Hit a pair of solo homers on June 26 vs. Cleveland...Blasted a pair of three-run homers on July 1 at Tampa Bay - drove in a season-high six RBI, which was the secondhighest, single-game total of his career, trailing only a seven-RBI performance on July 16, 2004 at Seattle...Hit his 20th home run of the season in the 15th inning on August 9 at Seattle -- marked the seventh time in his career and first time since 2014 that he has hit 20-or-more homers in a season…Martinez's homer was the first by a Tigers player in the 15th inning-or-later since May 16, 1978 vs. Seattle, when Lance Parrish hit a two-run walkoff homer...Broke a 3-3 tie with a solo home run in the eighth inning on September 9 vs. Baltimore -- was his 12th career go-ahead homer in the eighth inning-or-later and his third this season...Belted his third pinch hit homer of the season in the first game of the doubleheader on September 22 at Minnesota -- became the 12th player in club history to hit three pinch hit homers in a season and the first since Larry Herndon in 1986...Hit the fifth grand slam of his career on September 25 vs. Kansas City - marked his first grand slam since August 20, 2014 at Tampa Bay...Posted a .287 (116x404) batting average against righthanded pitchers…batted .295 (44x1149) with lefties on the mound...Ranked fourth in the AL with a .322 (88x273) road batting average…hit .257 (72x280) at Comerica Park...Compiled a .305 (95x311) batting average with 38 runs scored, 14 doubles, 17 home runs and 52 RBI before the AllStar break…hit .269 (65x242) with 27 runs scored, eight doubles, 10 home runs and 34 RBI after the All-Star break. Completed his fifth season with the Tigers in 2015, appearing in 120 games. Sidelined from May 19-June 19 with left knee inflammation. Began an injury rehab assignment with Triple-A Toledo on June 15 -- appeared in four games with the Mud Hens and hit .294 (5-for-17) with a run scored, a double and three RBI. Hit .326 (14-for-43) with seven runs scored, four doubles, one home run and 10 RBI in the month of June. Had a season-high four hits on July 6 at Seattle -- marked his 15th career four-hit game and his first since August 26, 2013 vs. Oakland. Hit safely in 20 of 25 games from June 19-July 19 and hit .330 (35-for-106) with 16 runs scored, nine doubles, five home runs and 17 RBIs during the stretch. Blasted a pair of home runs on August 6 vs. Kansas City, hitting a three-run home run in the third inning and a two-run homer in the fifth inning -- marked the seventh multi-homer game of his career (last, September 17, 2010 vs. Toronto) and his first with the Tigers...also drove in five runs, marking his sixth career game with five-or-more RBI (last, August 20, 2014 at Tampa Bay). Delivered a go-ahead RBI double in the 11th inning on August 15 at Houston -- was his seventh career go-ahead hit in extra innings (last, April 9, 2014 at Los Angeles Dodgers). Had a season-long, eight-game hit streak from September 13-21 -- hit .393 (11-for-28) with two runs scored, one double, one home run and seven RBI during the streak. Hit the 200th home run of his major league career on September 23 vs. Chicago White Sox -- became the sixth Venezuelan-born player to hit 200 career home runs. Posted a .348 (31-for-89) batting average vs. lefthanded pitchers...hit .219 (77-for-351) against righthanders. • Hit .241 (53-for-220) in home games...batted .250 (55-for-220) on the road. • Hit .272 (56-for-206) with 24 runs scored, 12 doubles, five home runs and 30 RBIs before the All-Star break...hit .222 (52-for-234) with 15 runs scored, eight doubles, six home runs and 34 RBIs following the All-Star break. Selected to the American League All-Star squad for the fifth time in his career as he established a career high with 32 home runs for the Tigers in 2014...Led the American League with a .409 on-base percentage and 28 intentional walks, while he was second with a .335 batting average and a .565 slugging percentage, third with 57 multi-hit games, tied for fourth with 188 hits and 15 game-winning RBI, fifth with 317 total bases, seventh with 65 extra-base hits, tied for seventh with 103 RBI, eighth with 32 home runs and 10th with a .326 batting average with runners in scoring position...Ranked as the toughest batter in the league to strikeout...fanning once every 15.26 plate appearances...Finished second in voting conducted by the Baseball Writers Association of America for the 2014 American League Most Valuable Player Award...Named Tiger of the Year by the Detroit Chapter of the Baseball Writers Association of America...Tabbed as having the best strike-zone judgement in the American League by Baseball America...Named King Tiger following the season by the Mayo smith society...Became the first player since Barry Bonds in 2004 to blast 30-or-more home runs and strike out 45-or-fewer times in a season...Recorded 100+ RBI for the fifth time in his career and second season with the Tigers -- also accomplished the feat in 2011, 2009, 2007 and 2004...Knocked a season-high three hits on April 9 at Dodger stadium -- equaled the high 13 other times on the season...Had a season-high 11 game hitting streak April 25-May 8 -- batted .405 (17x42) during that stretch...Named the Tigers Player of the Month for March/April after hitting .298 (25x84) with eight runs scored, three doubles, four home runs and 13 RBI in 23 games...finished the month with more home runs than strikeouts (4Hr/3so)...Hit home runs in back-to-back games May 7-8, May 18-19, June 20-21 and August 2-3...Hit .372 (42x113) with 17 runs scored, 10 doubles, nine home runs and 21 RBI during May -- ranked second in the American League with 42 hits, fourth with a .372 batting average, tied for fourth with nine home runs, tied for fifth with 10 doubles and tied for eighth with 21 RBI during the month...Recorded a season-best five RBI on August 20 at Tampa Bay -- hit his fourth career grand slam that same day...Tabbed the American League and Tigers Player of the Month for August after batting .350 (41x117) with 20 runs scored, five doubles, six home runs and 30 RBI during the month -- led the American League with 30 RBI, while he was tied for first with 41 hits, seventh with a .350 batting average and tied for seventh with six home runs...It marked the first American League Player of the Month selection of his career...Batted .378 (34x106) with 15 runs scored, seven doubles, five home runs and 15 RBI in 26 games in September -- ranked fifth in the AL with a .378 batting average during the month...Ranked second in the American League with a .371 (53x143) batting average vs. lefties...ranked third with a .323 (135x418) batting average against righthanded pitchers...Ranked fifth in the American League with a .324 (88x272) batting average at home...led the AL with a .346 (100x289) average on the road...Hit .328 (99x302) with 45 runs scored, 19 doubles, 21 home runs and 55 RBI in 80 games before the All-Star break... batted .344 (89x256) with 42 runs scored, 14 doubles, 11 home runs and 48 RBI in 71 games after the All-Star break. Returned to the Tigers lineup in 2013 after he was sidelined all of 2012 with microfracture surgery and repairs to both the medial and lateral meniscus in his left knee -- appeared in a career-high 159 games on the season...Ranked as the second-toughest batter in the league to strike out...fanning once every 10.77 plate appearances...Hit his third career grand slam on June 22 versus Boston -- drove in a season-high five runs that same game...Had a season-high 14 game hitting streak June 29-July 12 -- batted .446 (25x56) during that stretch...Recorded a season-high four hits on July 22 versus the Chicago White Sox -- matched the high with four hits on August 26 versus Oakland...Batted .390 (41x105) with 11 doubles, three home runs and 20 RBI in 26 games during July -- finished first in the American League with 41 hits, while he was second with a .390 average, and fourth with a .429 on-base percentage during the month...Collected the 300th double of his major league career on August 8 versus Cleveland...Batted .386 (44x114) with six doubles, two home runs and 13 RBI in 29 games during August -- first in the American League with 44 hits and a .386 average during that stretch...Hit .279 (63x226) with five home runs and 27 RBI with lefties on the mound...batted .314 (119x379) with nine home runs and 56 RBI against righthanded pitchers...Batted .258 (91x353) in 93 games prior to the All-Star break...led the American League with a .361 (91x252) batting average following the break...Established a new franchise record with nine hits in the American League Division Series versus Oakland...Batted .405 (17x42) in 11 games during the Tigers postseason run -- his .405 average ranks third among all postseason performances in franchise history, trailing only Sean Casey (.423 in 2006) and Alan Trammell (.419 in 1984). Sidelined for the entire 2012 season after he underwent microfracture surgery and repairs to both the medial and lateralmeniscus in his left knee on January 27, a procedure performed by Dr. Richard Steadman in Vail, Colorado. ... Dr. Richard Steadman assessed the stability of the ACL in the left knee of Martinez on April 4 and decidedreconstruction surgery was not necessary...Dr. Steadman performed a procedure that day to help aid in the healing ofthe ACL. Finished fourth in the American League with a .330 batting average during his first season with the Tigers in 2011 aftersigning as a free agent during the off-season...Tied for eighth in the American League with a .380 on-base percentage, while he tied for 10th with 103 RBI...secondtoughest batter in the league to strike out, fanning once every 11.7 plate appearances...drove in a run every 5.2 at-bats, tied for sixth best in the league...Collected 103 RBI during his first season with the Tigers -- marked fourth time he has finished with 100-or-more RBI during his major league career...Compiled a season-high 13-game hitting streak April 15-May 14, batting .468 (22x47) with six doubles, two home runs and 15 RBI...Sidelined April 19-May 5 with a strained right groin -- joined Triple A Toledo for an injury rehabilitation assignment, hitting .500 (3x6) with a double and two RBI in two games May 2-3...Drove in three-or-more runs in three straight games May 9-11 -- first Tigers player to do so since Dan Gladden accomplished the feat for the club August 10-12, 1993...he accomplished the feat a second time during the season, finishing with three-or-more RBI in three straight games September 5-7...Collected a season-best four RBI on May 10 at Minnesota -- equaled the high with four RBI on July 29 versus the Los Angeles Angels of Anaheim, August 26 at Minnesota and September 7 at Cleveland...Tabbed the American League Player of Week for May 9-15 -- hit .579 (11x19) with four doubles, two home runs and 11 RBI in five games during the week...Hit .337 (29x86) with nine doubles, three home runs and 19 RBI in 24 games during May -- tied for third in the American League with nine doubles during the month...Batted .429 (27x63) with four doubles, a home run and 16 RBI over a 17-game stretch June 10-28...Hit .370 (37x100) with eight doubles, a home run and 18 RBI in 27 games during June -- fifth in the American League with a .370 batting average and 37 hits during the month, while he tied for seventh with eight doubles...Batted .344 (33x96) with five doubles, two home runs and 16 RBI in 26 games during August...Belted his second career grand slam on September 7 at Cleveland...Batted .360 (36x100) with 10 doubles, four home runs and 26 RBI in 26 games during September -- second in the American League with 26 RBI during the month, while he tied for fourth with 10 doubles and finished eighth with a .360 batting average...Hit .316 (89x282) in 77 games prior to the all-star break...batted .345 (89x258) in 68 games following the all-star break...Batted .394 (61x155) with runners in scoring position, tops in the American League...Collected three hits in Game Six of the American League Championship Series on October 15 at Texas -- matched the franchise record for hits by a Tigers player during an American League Championship Series game. Selected to the American League's all-star squad for the fourth time in his career during the 2010 season with theBoston Red Sox....Fanned once every 10.3 plate appearances, the seventh-toughest batter to strike out in the American League...Collected the 1,000th hit of his major league career on May 8 versus the New York Yankees, a two-run home run offCC Sabathia....Belted a season-high two home runs on May 17 at Yankee Stadium against New York -- equaled the high with two homeruns on August 27 at Tampa Bay and September 17 versus Toronto....Equaled a career high with five hits on June 1 versus Oakland....Sidelined June 28-July 26 with a left thumb fracture....Ninth in the American League with a .354 batting average (28x79) in 22 games during June....Compiled a season-high 13-game hitting streak September 14-28, batting .415 (22x53) with two doubles, a triple, fourhome runs and 14 RBI....Batted .333 (36x108) with five doubles, a triple, seven home runs and 25 RBI in 27 games during September -- tied forsecond in the American League with 25 RBI during the month, while he tied for fifth with seven home runs....Led all American League players with a .400 batting average (62x155) against lefthanded pitchers...batted .257(87x338) versus righthanded pitchers....Hit .289 (71x246) in 66 games prior to the all-star break...batted .316 (78x247) in 61 games following the all-star break. Posted 3rd career 20-homer/100-RBI season,batting .303 (178-for-588) in a career-high 155 games split between CLE and BOS...Selected an AL All-Star forthe 3rd time...Drove in 100 or more runs for 3rd time in his career, the 1st since acareer-high 114 in 2007, and finished 5th in the AL with 108 RBI...Had 23 homers, 4th career 20+ homer campaign and 2 shy of hiscareer-high 25 in 2007...Ranked among AL switch-hitters in RBI (2nd), batting avg. (4th),on-base pct. (4th, .381), homers (5th) and slugging (5th, .480)...Joined Mickey Tettleton (1993) and Joe Torre (1964) as the onlyMajor Leaguers ever to post at least 20 homers and 100 RBI while playing 50 or more games at both catcherand first base...Combined for 85 appearances (82 starts) at catcher and 70 games (66 starts) at first base...Logged a .994fielding percentage (3 E/531 TC) at first base and a .992 mark (4 E/526 TC) behind the plate...Went 68 consecutivegames without a miscue at either position from 6/3-8/24...Hit .284 with 15 homers and 67 RBI in 99 games for CLE before being acquired by BOS in exchange for RHPsJustin Masterson and Bryan Price, and LHP Nick Hagadone at the 7/31 trade deadline...Batted .336 (71-for-211)with 8 homers and 41 RBI in 56 games for the Sox...Reached base safely in 131 of 155 games, and in 50 of 56 contests with the Sox, hitting safely in 46 of those.Hit .358 (59-for-165) over his last 46 games of the season beginning 8/13, 2nd in the AL over that spanbehind only NYY's Derek Jeter (.379)...Had a team, season-high 25-game hitting streak from 8/28-9/26, over which he batted .358 (34-for-95) with3 homers and 16 RBI...Was tied for the 2nd-longest streak in the AL behind a 27-gamer by SEA's Ichiro Suzuki(5/6-6/3)...Was the longest streak by a Red Sox since Manny Ramirez hit in 27 straight games in 2006...His 25-game hitting streak is the longest ever by a Venezuelan-born player, passing the mark of 24 set byChico Carrasquel with CWS in 1950...In the last 50 years, John Flaherty is the only player with a longer streakafter changing teams mid-season, a 27-gamer for SD in 1996...Extended the streak to 25 games with a 9th-inning single off Mariano Rivera at Yankee Stadium on 9/26...Theonly other player to preserve a hitting streak of at least 15 games with a hit off Rivera was Sandy Alomar, Jr.,who increased his streak to 26 games in 1997...Reached on an error as a pinch-hitter in the 9th inning on 9/27at Yankee Stadium to end the run...Became the 1st Major Leaguer to end a hitting streak of 25 or more gameswith an unsuccessful pinch-hit appearance since PIT's Freddie Lindstrom on 7/30/33...Hit safely in 29 consecutive starts from 8/28-10/3, batting .352 (38-for-108) in those games...Was the longeststarting streak in the AL since Johnny Damon hit safely in 29 straight starts for BOS in 2005...Reached basesafely in his last 30 starts of the regular season from 8/28-10/4...Went 5-for-6 on 8/2 at BAL, his 2nd game with the BOS, matching his career high for hits...Hit his 1st career grand slam off Aaron Laffey of the Indians on 10/3 at Fenway Park...Tied with Jason Bay for6th in the AL with a .533 clip (8-for-15) with the bases loaded. Season and production marred by a right elbow injury that robbed him over his power and forced him ontothe disabled list and operating table for two and a half months...Season started off well, hitting in a 2008 clubseason high 15 consecutive games from April 17-May 4 (.344, 21-61) to highlight an April in which he hit .350(28-80) w/5 2B & 9RBI in 21 games (.801OPS)...Hit just .221 (19-86) in May with 5 2B & 8RBI in 22 games(.548OPS) as he began to experience discomfort in his right elbow...Was removed from game of June 11 vs. Minnesota with right elbow inflammation and was placed on the 15-day DL the next day... Had surgery on June 13 in Cleveland by Dr. Mark Schickendantz to remove loose bodiesfrom his elbow joint...At the time of his injury he was hitting .278 (55-198) w/11 2B, 0HR & 21RBI in 54 games(.332OB%, .333SLG, .665OPS)...Began a rehab assignment at AA Akron and then AAA Buffalo beginning on August 15 and hit .308 (8-26) w/aHR, 3RBI over his rehab stint before being activated from the DL on August 29...Hit .278 (19-68) over the final5 weeks of the season upon activation with 6 2B, 2HR & 14RBI (.456SLG, .351OB) in 19 games at first base(5G), catcher (9G) and DH (3G)...Hit his first home run of the season in 208th at bat (58th G) on Sept. 2 vs.Chicago-AL (Danks)...Since 1900 only two other players during the live-ball era came off seasons of 25 ormore homers and failed to hit a home run over their first 200 ABs in the following season: Morgan Ensberg in2004 and Earl Averill in 1933 (ELIAS SB)...Overall on the year he made 54 starts at catcher (55G), 9 starts at first base (10G) and made 5 starts atDH...Threw out 31% (10-32) of baserunners attempting to steal off him and compiled a fielding % of .991 (3E,347TC) at catcher...Had five 3-hit games and three 3-RBI games on the year...Hit the first walk-off home runof his big league career on Sept. 16 vs. Minnesota (3-5, 3RS, 3RBI), his 2nd HR of the season...Was ejectedfrom game on Sept. 19 vs. Detroit and eventually suspended 2 games (served 9/25-26) for his actions duringa fight with the Tigers...Had a .923 OPS (.423OB, .500SLG) off LHP...Hit .301 (62-206) as the catcher...Hit.293 (17-58) when batting 5th, .333 (43-129) with runners on base and .343 (24-70) with RISP. One of the game's elite offensive catchers enjoyed another standout offensive season andwas arguably the club's Most Valuable Player in establishing new career-highs in HR &RBI... Finished the season with the 7th most RBI in the American League with a careerhigh114...Had 94 RBI as a catcher, the highest total among Major League catchersand the 2nd highest single-season total in franchise history by a catcher...His 22 HRas a catcher led all MLB backstops (remainder of his HR/RBI came at first base) ...Alsoranked among the AL leaders in HR (career-high 25, T14th), average with RISP (.356,7th), doubles (40, T12th), extra base hits (65, T13th), slugging % (.505, 10th) and battingaverage (.301, 17th)...Was also 6th among AL hitters w/a .324 (55-170) average after the6th inning and his .879 on-base+slugging ok was 13th in the AL... Made 118 starts (121G)at catcher (Indians were 70-48 in his starts) and 24 starts (30G) at first base (also made 3starts at DH)... Has only 1 error in 52 career games at first base...Threw out 30 of 100runners (30.00/0) attempting to steal off him, the 3rd best mark among regular ALcatchers behind Laird and Johjima...Threw out 16 of 116 (13.80/0) in 2006... Indianspitchers compiled an ERA of 4.01 (1042.2IP, 464ER) when he was behind the plate... Hitsafely in 112 of 147 games and reached safely in 129 of 147 games ... Collected an RBI in 74 of 147 games... Homered inhis 2nd career All-Star game, the first Indian to homer in an ASG since Sandy Alomar in 1997... Had 27RBI in May (T2nd inthe AL) ... Collected 4 hits on April 4 @CWS and May 3 vs. TOR... Collected an RBI in 8 straight games on May 24-June1... Hit 2 homers on June 1 vs. Detroit (3rd career multi-HR game) and had 4 hits on April 4 and May 3... From May 31 thruthe end of the season he hit .298 (117-393) with 17HR & 73 RBI in 104 games... Hit .349 (38-109) in June w/5HR &19RBI. .. Hit .312 (123-394) w/21HR & 93RBI when hitting 4th and his .533 clean-up slugging ok was 6th among AL #4hitters ... Reached base safely in 32 straight games from August 22 thru Sept. 26 and 81 of 88 from June 17 thru the end ofthe season ... From August 22 thru the end of the season he hit .299 (38-127) with 7 HR & 28 RBI in 33 games ...WhenMartinez drove in a run Indians were 47-28 (.627) ...OPS went from .936 in 1st half to .810 in 2nd half ... Hit .313 (82-262)with runners on and .400 (24-60) with RISP-20uts. Enjoyed another solid offensive season...Finished the season withthe 11th highest average (.316) in the American League as he finished 4th among Major League catchers inhits (151), 4th in RBI (81) and 4th in slg (.461)...RBI total at catcher went from 78 in 2005 to 81 in 2006 as henow owns 3 of the top 6 RBI seasons among catchers in the 106-year history of the Cleveland Indians...Wasalso 10th in the AL with a .391 on-base % (A-Rod 9th @.392)...Hit above .312 in every month except May (.165, 15-91, 0HR, 9RBI) after hitting .398 in April (37-93, 5HR,20RBI)...Reached base via hit or walk in 45 straight games from Sept. 17, 2005 thru May 6, 2006, the longestsuch streak in the Majors since STL OF Jim Edmonds in 2004...Overall reached safely in 132 of 152 gamesbatted in (each of first 30)...Enjoyed an Indians season-high (tied w/Blake) 15-game hitting streak from April2-20 (.413, 26-63, 4HR, 15RBI)...Also hit in 13 straight games from Sept. 13-26...HR'd in a career-high 3straight games (4/18-20) and hit a career-high 3 doubles on April 30 vs. Texas...After the May blip (was 0-21, 5/9-17), from June 1st on he hit .332 (129-388) with 11 HR & 64 RBI in 104games and from July 1 thru the end of the season he hit .339 (100-295) with 6 HR & 43 RBI in 79 games...Hit.343 (34-99) in July and .350 (35-100) in September (3HR, 19RBI, 28G)...Compiled a fielding % of .990 (8E,806TC) in 133 starts/127 games at catcher and threw out 16 of 116 potential basestealers (13.8%)...FromJuly 7 thru the end of the season he threw out 22% (11-50) after throwing out 7.5 % up to that point (5-66)...Indians were 65-62 (.512) in his starts...Made 3GS at DH and made the first appearances of his career at firstbase (debut on 6/23 vs. CIN), making 19 starts (22G) at first base (0 errors in 154TC at 1B)...Enjoyed his firstcareer 2-homer game on June 10 at Chicago-AL (2nd career multi-H gm) and had his 2nd career 5-hit gameon July 4 vs. New York-AL...Season-high 4RBI on June 7 vs. Oakland...Collected 500th career hit on August11 vs. KC...Hit .332 (119-358) with w/10HR & 65RBI and .323 (52-161) with RISP...Hit .316 in the 1st half and .317 in the2nd half...From June 15 thru the end of the season he hit .330 (114-345) with 6HR & 50 RBI in 93 games...His.460 slg % in the #4 spot was 18th in the AL among clean-up hitters with 146PA in that spot...Hit .315 (90-286)with runners on and .352 (25-71) when playing first base and .364 (4-11) at DH...Hit .415 (44-106) on the firstpitch and .303 (53-175) from the 7th inning on, which was tied for 15th in the American League...From theAll-Star Break of 2005 thru the 2006 season he hit .337 (281-835)...Played for Venezuela in the World BaseballClassic. One of baseball's top catchers, the 26-year old Martinez led allMajor League catchers in RBI (78) for the 2nd straight seasonand finished the season with 7th best batting average in theAL at .305 (167-547) after bottoming out at .191 on May 24(ranked 92nd out of 94 batting average qualifiers on 5/24)...Made a strong case for winning his second consecutiveSilver Slugger Award (Varitek won it) as he led AL catchers inaverage, RBI, hits, runs, doubles and was T2nd in HR (19)...Finished tied for 18th in the AL MVP balloting...After hitting.192 (28-146) thru May 27 (2HR, 12RBI, 40G), he hit .347(139-401) from May 28th until the end of the season with27 2B, 18 HR & 68 RBI in 107 games...From June 12 thruthe end of the season he hit .360 (127-353) w/14HR & 59 RBI in 95 games (hit safely in 80 of them)...His 2nd half batting average of .380 (100-263) led the Major Leagues (11HR, 45RBI, 71G) and his 100 hits were3rd in MLB after the break...From July 23 thru the end of the season he hit .380 (92-242) w/10HR & 42RBI in62 games... Enjoyed a career-long 17 game hitting streak from June 17 to July 6 (.358, 24-67, 14RBI)...Was thelongest streak by an Indian in 2005...Made 5 errors in 967 total chances in 139 starts behind the plate for Eric Wedge as his .995 fielding % ranked5th among AL catchers...Tossed out 25 of 121 (20.7%) baserunners attempting to steal off him (4th among ALcatchers)...Indians were 78-61 (.561) in his starts as Tribe pitchers compiled an ERA of 3.68 (1233.0IP, 504ER)with him catching...Had a 48-game errorless streak from May 8-July 15...Was 2nd in the Major Leagues with 142games caught to Jason Kendall (147)...Was 2nd to Kendall (1044) in total chances with 967...Hit .402 (39-97) in August w/5 2B, 5HR & 17RBI in 25 games and was named AL Player of the Week, August22-28...Homered in consecutive games, April 14-15 & May 30-31...Scored a career-high 4 runs on August 26 atToronto and had back to back 4-hit games on August 25 (@TB) and August 26 (@TOR)...Was the first Indianshitter since Sandy Alomar in 1997 to accomplish the feat...From August 20 thru the end of the season he hit .385(55-143) w/6HR, 24RBI, 38 games...Hit .352 (37-105) in Sept/Oct. (2HR, 12RBI) and hit safely in 22 of his final24 games (.374, 34-91) from Sept. 6th on...His .303 (10-33) average when the count was 0-2 ranked 3rd among AL hitters...Hit .311 (78-251) with runnerson base and .302 (52-172) after the 7th inning...Hit .353 (85-241) when batting in the #5 spot in the order with 7HR & 32 RBI in 63 starts...Hit .366 (34-93) on the first pitch. Established himself as one of the top offensive catchers in baseball in 2004 while providing solid defense andleadership behind the plate in his first full season in the big leagues...Provided Eric Wedge with a reliable andconfident clean-up hitters after being installed in the spot in early May, a move that propelled the offense to newheights and catapulted the team to an above .500 record from late May thru the end of the season...Set a new clubrecord for RBI by a catcher with 101, shattering Sandy Alomar's 1997 mark of 83 on August 16th at Texas in theseason's 120th game...His 21 HR & 101 RBI as a catcher led all Major League catchers.Overall he finished tied for 10th in the AL in RBI (108) and 8th in RBI ratio w/1RBI every 4.8 at bats...Was 7th inthe AL w/a team-high 10 int'l walks...His 23HR were 1 shy of Roberto Alomar's club-record total of 24 by a switchhitterin 1999...Was named to his first American League All-Star Team after hitting .290 (83-286) with 12HR &63 RBI in 76 first half games (0-1 at ASG) and after the season he was named Indians "Man of the Year" as votedon by members of the Cleveland BBWAA Chapter and received his first career H & B Silver Slugger Award (alsoreceived a 7th place vote on the AL MVP ballot)...He is the first catcher in Indians franchise history to be awardeda Silver Slugger. Season got off to a slow start, hitting .246 (30-65) with 4HR & 9RBI in April before hitting .315 (29-92) w/5HR& an AL-best 30 RBI in May and .333 (31-93) w/2HR & 18 RBI in June...From May 1 thru the end of the seasonhe hit .288 (131-455) with 36 2B, 19HR & 99 RBI in 122 games...Was installed into the clean-up spot for the firsttime on May 3 and for the year in the #4 hole he hit .285 (127-445) with 35 2B, 18 HR & 97 RBI in 114 starts...Wasnamed AL player of the week twice (5/10-16, 10RBI; 7/15-18), the first player since Jim Thome in 2001 to be sohonored.Enjoyed a career-night on July 16 at Seattle, going a career-best 5 for 5 w/3HR & 7RBI (all new careerhighs)...HR'd from both sides of plate and it was his first career multi-HR game...Only 2nd switch-hitter in clubhistory to hit 3HR in a game and the first ever Indians catcher to hit 3HR in a game...July: .304 (31-102) 6 HR& 22RBI (25G)...Hit in a career-high 14 straight games from May 28 to June 16, hitting .415 (22-53) over the spanw/a HR & 12RBI... 1st career triple on June 2 vs. Texas and 1st career pinch hit HR on July 18 at Seattle...On theyear he was 3-6 as a PH w/a HR & 2 RBI...Had a 4-hit game on June 22 at Chicago-AL...Missed 3 games (6/11-13) w/a right foot sprain and 3 games in early August with a right hamstring strain.On the year he made 124 starts at catcher (132 games overall) and 7GS at DH...On the year he threw out 25 of114 runners (21.9%), including 24 of his last 93 (25.8%, 4th among regular AL catchers w/at least 64 attemptsagainst) after starting the year 1 for 21...Has 6 errors in 932 TC (.994 fielding %, 6th among AL catchers)...17of 23 HR came left-handed...Hit .237 (44-186) over his last 53 games from July 27th thru the end of the season& was 0 for 15 from 8/18-24...Hit .319 (84-263) with runners on base w/9HR & 94RBI...Hit .429 (42-98) on thefirst pitch, the 14th highest figure among AL batters...Hit .288 (46-160) from the 7th inning on w/11HR & 26RBI. Ended the season with consecutive 12-game hitting streaks and hit in 24 of his last 25 games played at themajor league level...Spent the first three months of the season at AAA Buffalo, hitting .328 (90-274) with 19 doubles,7 HR & 45 RBI in 73 games for the Bisons and was named to the Triple A All-Star Game (did not play)...Victor wason an 11-game hitting streak when he was recalled to Cleveland on 6/27 while sporting a .437 (45-103) average inJune with 12 2B, 3HR & 22 RBI in 25 games to raise his average from .263 to .328...Hit in 24 of his last 26 TripleA contests...At the time of his promotion he ranked 4th in the International League in batting average (.328), 2ndin hits (90), tied for 5th in RBI (45) and 5th in on-base % (.395)...Got off to a slow start at the big league level,hitting .224 (17-76) over 23 games from 6/27 to 7/31 and caught fire over the last 7 weeks of the season despitea two-week stint on the disabled list...Was on the 15-day DL w/a sprained right ankle from 8/9-9/1 after sprainingthe ankle running the bases on 8/8 vs. Anaheim...Had two 12-game hitting streaks from 8/1-9/9 and from 9/11 untilhis season ended early on 9/24 (family reasons)...From 8/1 thru the end of the season he hit .349 (29-83) with 22B, a HR & 8 RBI and hit safely in 24 of his final 25 games... Only game he didn't hit safely in after August 1 was aPH appearance at KC on 9/10 (ground out to third)...He threw out 8 of the 28 (29%) of the runners attempting tosteal and made just 1 error in 250TC (.996 fldg%, 39GS)...48 of his first 55 major league hits were singles...Spent2003-04 off-season working out in Cleveland under supervision of strength coach Tim Maxey. Victor added yet another minor league MVP award to his resume while getting his first taste of big leagueaction...Spent most of the year in AA Akron where he was named the Most Valuable Player of the Eastern League...Marked the second consecutive season in which Martinez won his league batting title and MVP award (CarolinaLeague in 2001 at A Kinston)...Won the Eastern League batting title by hitting .336 (149-443)...Also led the leaguein slugging % (.576), on-base % (.417) and runs scored (84) and finished second in the EL in doubles (40) andextra-base hits (62)...His 22 home runs were tied for second in the league...His 40 doubles were a AA Akron franchiserecord...In addition to the Eastern League MVP honor he was named to the EL Post-Season & Mid-Season All-StarTeams and to the Sportsticker Minor League All-Prospect Team and won his second straight Indians Minor LeaguePlayer of the Year award...Was also named the best batting prospect and best defensive catcher in the EasternLeague and the #2 prospect overall in the Indians system by Baseball America...After the season was awardedthe Topps/Minor League Baseball Player of the Year Award in the Eastern League...Was selected to appear in theAA All-Star Game and was the starting catcher for the World Team at the 2002 Future's game in Milwaukee on 7/7,going 1 for 2 w/a RS & RBI...Best month was July, hitting .414 (36-87) with 13 2B, 5HR & 19 RBI in 24 games andwas named Topps Player of the Month for July in the Eastern League (had seven 3-hit games in July)...Collectedan RBI in 7 straight games from 5/24-30...Led Indians organizational hitters in batting average (.336), RBI (85),runs (84) and finished T1st in HR(22) and 2nd in hits (149)...Victor was recalled from AA Akron on 9/9...Madehis Major league debut and collected first major league hit and RBI on 9/10 vs. Toronto (1-4 w/2RBI)...The 2-runsingle came off Justin Miller... Hit his first major league homer on the season's final day on 9/29 vs. Kansas Cityoff Darrell May...Made 7 starts at catcher for the Tribe (9 games at catcher) as the Indians went 3-4 in his starts...Tribe pitchers compiled an ERA of 3.65 (69.0IP, 70H, 28ER) while he was behind the plate as Victor threw out 2for 13 potential basestealers (15.4%). Had an outstanding season at Kinston, hitting an organizational-high .329 (138-420) w/33 2B, 2 3B, 10HR& 57 RBI in 114 games...His efforts earned him the Tribe's Minor League Player of the Year, Carolina League MostValuable Player and a spot on the Carolina League Post-Season All-Star Team and played in the mid-season all-stargame...Was also named the 10th best prospect and best defensive catcher in the Carolina League by BaseballAmerica and was named to the Topps Class A All-Star Team...Also led the organization in hits (138) and doubles(33)...His .329 average was tops in the Carolina League as was his .488 slugging %...He also ranked 4th in the leaguein hits, tied for 4th in doubles, 4th w/a .394 on-base % and 5th w/45 extra base hits...Over the last two months ofthe season he hit .376 (71-189) from 7/1 thru the end of the year w/6HR & 28 RBI and during the month of July hehit .429 (42-98) with 11 2B, 3 HR & 20 RBI and was named Topps Player of the Month in the Carolina League forhis efforts...Overall, he collected a hit in 43 of his last 48 games on the year and had hitting streaks of 13 and 10games (two 10G streaks)...Over his 106 games at catcher hit compiled a fielding % of .985 (1061TC, 16E, 8PB)...Was added to the 40-man roster on 11/19. Began the year at Class A Kinston of the Carolina League, where he hit .217 (18-83) with 7 2B & 8 RBI in 26games before being placed on the disabled list with rotator cuff tendonitis in his right shoulder on 5/14 and missedtwo months of the season...Was activated off the DL on 7/20 and transferred to Columbus of the South AtlanticLeague, where he spent the remainder of the season...Overall he hit .371 (26-70) at Columbus to post a combined2000 average of .288 (44-153)...He appeared in 45 games at catcher at Kinston and Columbus, compiling a fielding% of .983 (7E, 423TC)...Played for Oriente of the Venezuela Winter League after the season, hitting .304 (34-113)with 6 2B, 4 HR & 21 RBI in 36 games...Prior to the season he was named the best defensive catcher in the Indiansorganization by Baseball America. 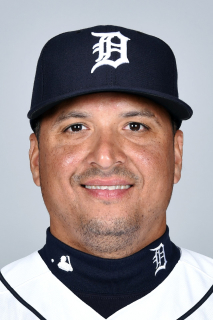 October 29, 2018 DH Victor Martinez elected free agency. November 3, 2017 Detroit Tigers activated DH Victor Martinez from the 60-day disabled list. September 3, 2017 Detroit Tigers transferred DH Victor Martinez from the 10-day disabled list to the 60-day disabled list. Irregular heartbeat. August 27, 2017 Detroit Tigers placed DH Victor Martinez on the 10-day disabled list. Irregular heartbeat. June 28, 2017 Detroit Tigers activated DH Victor Martinez from the 10-day disabled list. June 16, 2017 Detroit Tigers placed DH Victor Martinez on the 10-day disabled list. Irregular heartbeat. May 22, 2017 Detroit Tigers activated DH Victor Martinez from the paternity list. May 19, 2017 Detroit Tigers placed DH Victor Martinez on the paternity list. June 19, 2015 Detroit Tigers activated DH Victor Martinez from the 15-day disabled list. June 14, 2015 Detroit Tigers sent DH Victor Martinez on a rehab assignment to Toledo Mud Hens. May 19, 2015 Detroit Tigers placed DH Victor Martinez on the 15-day disabled list. Left knee inflammation. November 14, 2014 Detroit Tigers signed free agent Victor Martinez. November 14, 2014 Detroit Tigers signed free agent DH Victor Martinez. October 30, 2014 DH Victor Martinez elected free agency. October 29, 2012 Detroit Tigers activated DH Victor Martinez from the 60-day disabled list. March 12, 2012 Detroit Tigers placed C Victor Martinez on the 60-day disabled list. Recovering from January 2012 left knee surgery. May 4, 2011 Detroit Tigers activated C Victor Martinez from the 15-day disabled list. May 2, 2011 sent DH Victor Martinez on a rehab assignment to Toledo Mud Hens. April 19, 2011 Detroit Tigers placed C Victor Martinez on the 15-day disabled list. Strained right groin. November 26, 2010 Detroit Tigers signed free agent C Victor Martinez. November 7, 2010 C Victor Martinez elected free agency. October 4, 2010 C Victor Martinez assigned to Caribes de Anzoategui. July 26, 2010 Boston Red Sox activated C Victor Martinez from the 15-day disabled list. June 29, 2010 Boston Red Sox placed C Victor Martinez on the 15-day disabled list retroactive to June 28, 2010. Fractured bone in his left thumb. October 9, 2009 C Victor Martinez assigned to Caribes de Anzoategui.